My garden wouldn’t get within a mile of Chelsea. It is a plain square of grass with a few flowering weeds, some rotten apples (currently) and the usual detritus that accompanies children (trampoline, slide, residential complexes built for ants from sticks, grass and probably cat poo). Imagine my green-fingered delight then when I was asked to review some of John Lewis’ latest outdoor LED lighting. Goodbye wasteland, hello fairy dell! Arrrr! Holding this lantern aloft I have been a scary pirate and a fisherman so with the kids it’s safe to say it’s popular. 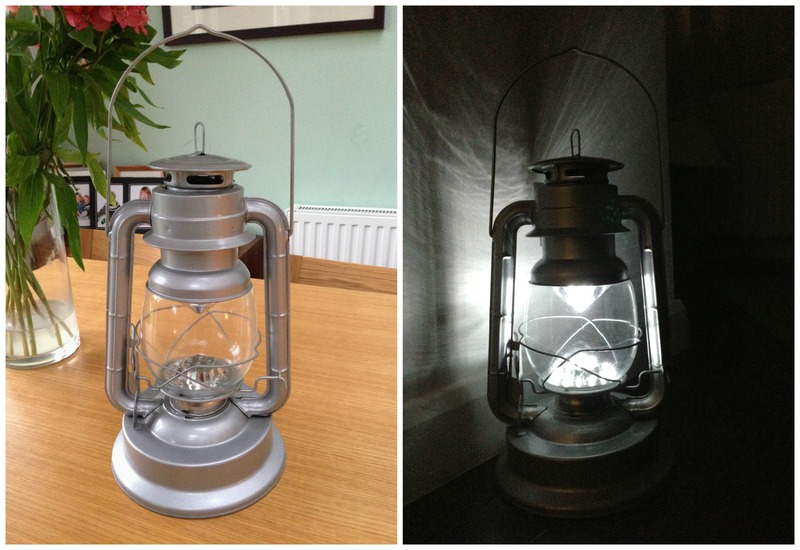 This battery operated lantern has 21 LED lights (non-replaceable – I guess they last a long time) and mimics the style of a good old-fashioned lantern that you might see aboard ship (ahoy there). It’s not smooth and slick by any means – bits move, twist and go up and down (intentionally) as if it were a 50-year-old lantern that had been dragged into the 21st century and pimped with LEDs. That is, it looks authentic. This does lead me to wonder how long it will stay looking good – here you need to trust John Lewis’ tradition of quality. To me, ‘rattan’ evokes images of basket weave bathroom furniture, the cracks in the weave dusted with old talcum powder. 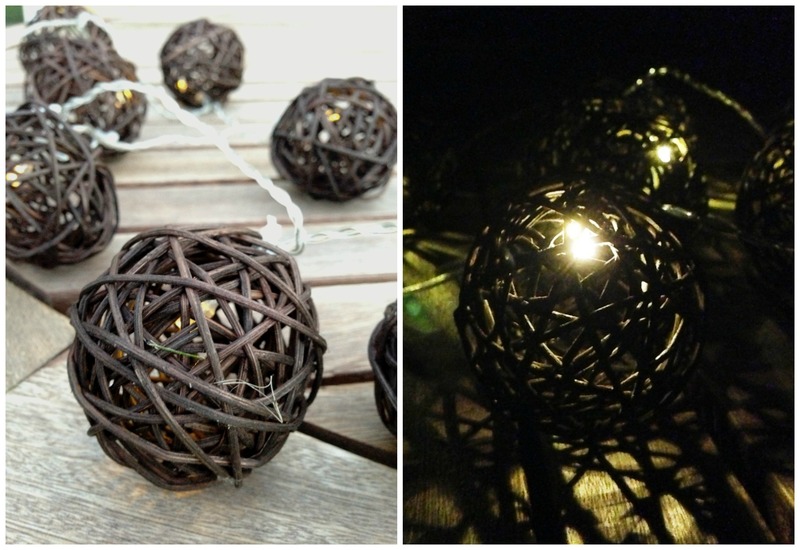 Fortunately, these rattan line lights are far more appealing than that. Think glamping in a yurt; think secret garden; think … well, in my case, think ‘these are a darned sight better than our faded butterfly lights that have endured several winters and wet summers and have now seen better days’. It took a couple of days in the garden to get these 10 solar powered LED light ‘balls’ up to their full strength, but once they were I was pleasantly surprised by how attractive they are. As with the lantern, they are not exceedingly bright but, really, you don’t expect more from decorative lights. They have a pretty glow and an equally pretty shadow. I was slightly concerned that the rattan balls would become rattan pulp after a couple of days in the garden but they seem to have survived the last few days of wind and rain in tip top condition. I did wonder though what to actually ‘do’ with these lights. Whilst the total length of the lights (including the wire leading to the solar box) is 10.7ft, the length of the lights themselves is only 4ft. This isn’t quite long enough to make a real feature of them (for example, wound along a decking area or draped in a tree). John Lewis – I like these lovely lights very much but I would have preferred them to be longer. More balls please! These products were sent to me free-of-charge and I was asked for nothing other than an objective review. The products are not currently available on the John Lewis website but keep your eyes peeled for them in the outdoor lighting section!